Innovative is here to address any concerns you may have. Below are frequently asked questions; if your concerns aren’t addressed below, please reach out to our customer service team by calling 800-524-2744, emailing customerservice@innovativeworkspaces.com or web chat. Does the base include the anti-collision safety feature? Yes. It’s also sometime called anti-pinch. When the table base encounters resistance (something is blocking the movement of the base), the anti collision mechanism kicks in and halts the movement of the table. How long is the base covered by warranty? Electric height adjustable tables are powered by motors. Anytime there’s a motor and a moving part, there’s a greater possibility that something will go wrong. You want a good warranty to go along with your new table. HAT Contract offers a Lifetime warranty on the mechanical parts of the product and a 7 year warranty on the motors and electric elements. This is one of the best warranties you’ll find in the industry and underscores the confidence we have in the quality of our product. Does the base include a position preset control panel? All HAT bases come with a programmable handset as a standard feature. Up to 4 positions. What is the load capacity of the base? Your table may go up and down several times a day depending upon how much position variation you like. And each time it does, those motors are managing a load (weight) of whatever is on that work surface as well as the weight of the work surface itself . So, you want strong, fast and reliable motors doing the lifting. Each HIHAT leg has it’s own motor and they are fast and quiet (view spec sheet). For our Hi HAT standard rectangles, corner units and 120s (two leg HAT versions) the weight capacity is 300lbs. For our L Units (3 legs), the weight capacity is 350lbs. Our Mid HATs have a load capacity of 300lbs. Our Conference Table Bases have a load capacity of 350lbs. The size of the base you need is determined by the size of the work surface that will be placed on top of the base. HAT bases will accommodate virtually any application and work surface, whether the requirement is rectangles, corners, 120s or L units. HAT offers a large and a small expandable frame in both the Hi HAT and Mid HAT models. What is the adjustment range of the base? Generally, the more range the better. The standard height of typical desk is 29”. Adjustable tables typically adjust at least 17 inches, from a low of 25” or so to at least a height of 42”. You may have several height preferences. Our Hi HAT Base has an adjustability range of 23.75”-49”. Our Mid HAT Base adjusts from 27.25″-46.75” which is plenty of range for most projects and applications. How do I counterbalance my monitor arm? You must attach the monitor to the arm, and you must place the arm in the mount, prior to attempting adjustments. Press the arm down to approximately parallel with the desk prior to turning the strength adjustment screw. This relieves pressure on the gas cylinder and makes it easier to adjust. If the arm is too strong, turn the adjustment screw clockwise. If the arm is too weak, turn the adjustment screw counter-clockwise. Depending on the weight of your monitor, you may have to make 15-20 turns. After each few turns, stop to check to see if the monitor remains in place when you remove your hand from it. 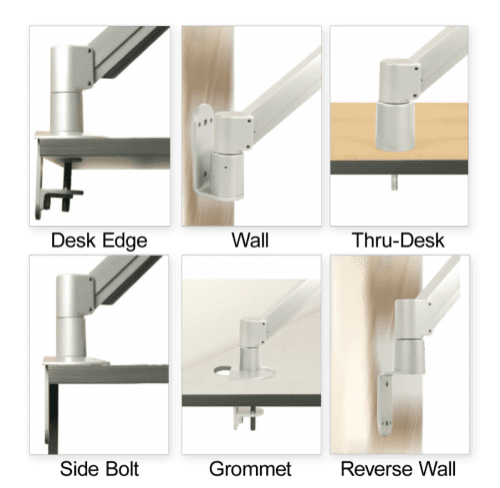 If you follow these steps and are still unable to get the arm to float, or if you reach a point where you can no longer turn the screw, it is possible that your monitor is outside of the weight range of your mounting arm. Please contact Innovative customer support at 800-524-2744 for assistance or watch the video. How do I purchase internationally? Please visit our contact page to reach out to Innovative’s international subsidiaries. What can I do with my FLEXmount? The FLEXmount offers six different options for mounting or reconfiguring your monitor arm. How do I remove the Tablik puck from the back of my tablet? Using a citrus-based solution will help to remove some of adhesive from the puck, then you should be able to pry the Tablik puck off of the tablet. How do I adjust my tilter? You can adjust the tension of the tilter by using the hex key that was included with your monitor arm. By using the hex key at the bottom of the tilter, you can tighten or loosen the tension based on your needs. How do I know if my monitor is VESA-compliant? VESA-compliant monitors follow an industry-standard mounting system. There will be a 75mm (about 3″) or 100mm (about 4″) square screw hole pattern on the back of your monitor. If you do not see one, remove the base from the monitor (see your monitor’s User’s Guide for instructions on how to do this). What is the lead time for my monitor mount? Generally, the average lead time for our monitor mounts is 3-5 business days. All of Innovative’s products are made to order, allowing for customizable options to meet the needs of customer applications. Lead times for individual products depend on available materials and order quantities. Where do you manufacture your products? Where is the product shipped from? Most of Innovative’s products are designed and assembled in the US. Most products are shipped from our Easton, PA headquarters. Monitor arms sold after 2010 come with a 10 year warranty. Winston Workstation® includes a 5 year warranty, Tablik® includes a 3 year warranty, and Busby® and the Bild® electric height adjust column are covered with a 1 year warranty. You can visit our warranty page for more information. What quality and environmental standards are you compliant with? Innovative strives to provide the best product possible through our quality standards and award winning design. Our products are tested to 30,000 cycles, far exceeding BIFMA industry standards. You can learn more about Innovative’s commitment to quality here. To reduce environmental impact, Innovative is fully compliant with Restriction of Hazardous Substances Directive (RoHS), WEEE Directive 2002/96/EC and the EU Directive on Packaging and Packaging Waste (94/62/EC). To learn more about Innovative’s environmental ethics, click here. May I purchase directly or do you have distributors? You are welcome to purchase directly from Innovative by calling 800-524-2744, or sending an email to orders@innovativeworkspaces.com. Innovative’s monitor mounting solutions are also available through various re-sellers and dealers. For orders placed by phone, Innovative can accept credit cards or credit terms to qualifying customers. To apply for credit, please contact Innovative’s sales team at 800-524-2744. Innovative will assess sales tax on orders shipping to Pennsylvania addresses unless you have a tax-exempt certificate, in which case no sales tax will be assessed. Do you offer government pricing? Innovative is a GSA Contract Holder. GSA Contract #: GS-28F-011GA. Please visit our Government page for more information. Our normal business hours are 9 a.m. – 5 p.m. EST Monday-Friday. During non-business hours, you can email to customerservice@innovativeworkspaces.com or send a message in web chat and your inquiry will be responded to the next business day. All returns must be labeled with a valid Return Authorization (R/A) number on the outside of packaging. Shipments without R/A numbers will be rejected. R/A numbers may be obtained by calling 800-524-2744.
a. RESTOCKING FEES — Standard Items totaling value of $1,000 or less will incur no restocking fee if returned in resalable condition and within 30 days of original shipment. After 30 days of original shipment and with prior approval, a restocking fee of up to 25% will be applied. Standard Items totaling value of more than $1,000 may be returned if in resalable condition and within 30 days of original shipment, and will be subject to a restocking fee of up to 25%. b. DEFECTIVE ITEMS — Defective items may be returned within limits of the Warranty. c. CUSTOM-CONFIGURED ITEMS — Non-defective Custom-configured Items are not returnable. What is your Schedule B number for importing? Innovative’s Schedule B number is 8473.305100. Where can I obtain a copy of Innovative’s NAFTA certificate? Innovative does not participate in NAFTA. Our products are classified in subheading 8473.30, which is covered by the Information Technology Agreement and puts the duty rate at zero for participating countries (Canada and Mexico). Since the duty rate should be zero, there is no reason to issue a NAFTA certificate.